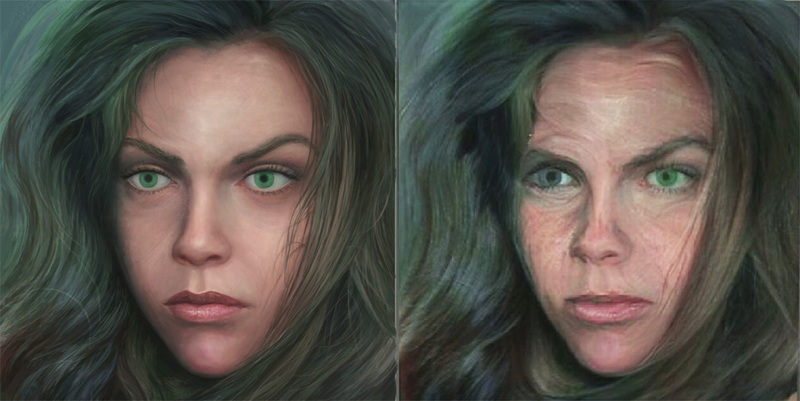 If you are new to this series all the images are based on recent photos of me after basically being fed through a neural network (which can change age, gender, etc. ), then edited and painted using various programs. None of the people actually exist, and thus they are like self portraits from alternate universes. This was one of the most difficult in the series so far, though that hopefully isn’t apparent in the final image. I’d rather I made it look easy and natural than a prolonged struggle. The reason it was difficult is because it’s an intermediary sort of image, not working from my imagination, and not working from reality. And because of the style, any and all mistakes are immediately and conspicuously apparent. 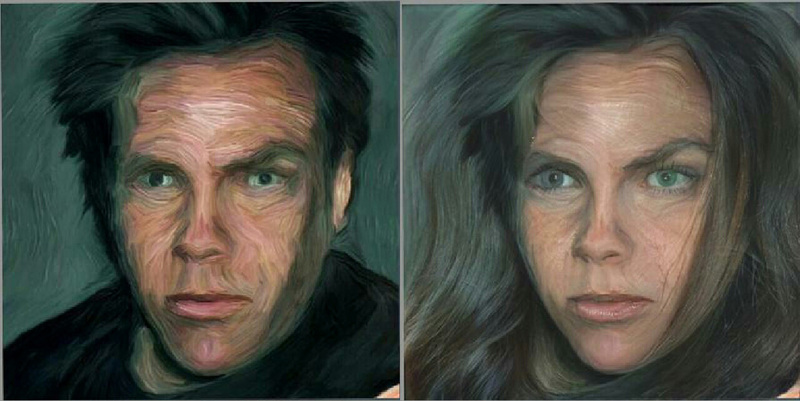 Left, an old digital painting self-portrait, and right is something Faceapp did with it. 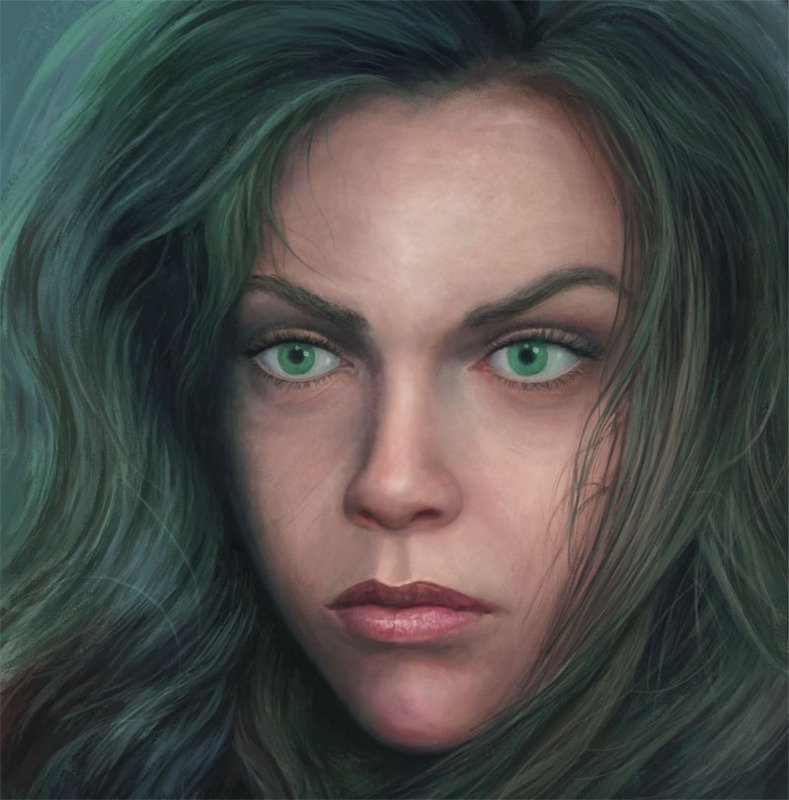 You may notice that this piece is a bit more illustrational, and that’s partly because in trying to correct errors I went sorta’ academic, as in I used techniques to create proper eyes and tried to integrate the result seamlessly. A note for artists concerning drawing/painting eyes. It’s best to do the shape of the eye first. Get the lids and shape of the ball of the eye down before adding the iris, pupil, and lashes. I’m not a portrait artist, nor a realist, and my favorite way to work is directly from my imagination, and without any source imagery. But some projects require different skill sets, and so I have to develop them. In the end I can integrate new skills and create new hybrids. Generally it’s best to move from the general to the particular. Here I’d already put in the pupils, and later I had to take them out and restructure the eyes. 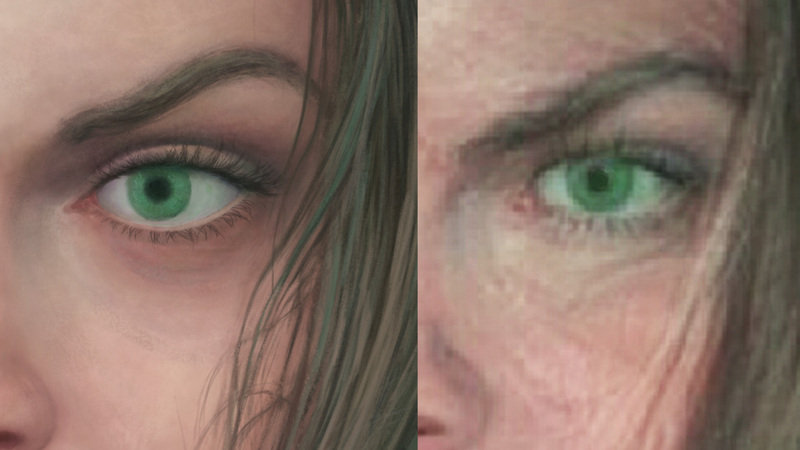 Yup, it was a real struggle trying to keep the likeness, but correct the anatomy, make it more realistic, but keep the illustrational or painterly quality. I was thinking this morning that this DOESN’T look like a work by me, unless you are already familiar with the series, in which case the visage might seem very familiar. Very standard advice for artists is that you need to work in a consistent, recognizable, signature style. I find such a prospect appealing to a much younger versions of my self, with less experience, but by now I find it much more appealing to explore a range of possibilities and create new styles and images rather than be settled in my artistic ways. If I were magically presented with this image a couple years ago, I don’t know if I’d connect with it as something I created, or would create, and I rather think that’s a good thing. Here are a couple pics showing the finished product, up close, next to the source of inspiration. The app creates a postage-stamp sized image for sharing on social media, but it is itself useless (at least for me) as a finished artistic creation. Not only are there lots of imperfections, but it’s also far too small to make a decent print. Here you can see how I recreate non-existent detail so that the image can be printing large (in this instant 24″x24″ at 300 dpi). Note that I’m not drawing over the original, but drawing next to it. I had to invent a lot of hair. There are “hair brushes” one can use in PS, but I like to work with just one brush — a pastel brush — and tweak a few of the settings. 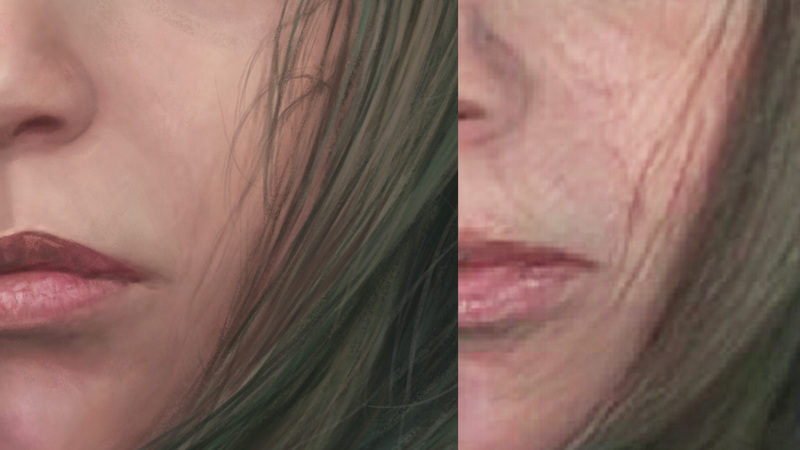 You may have notices how much I changed the mouth and nose. 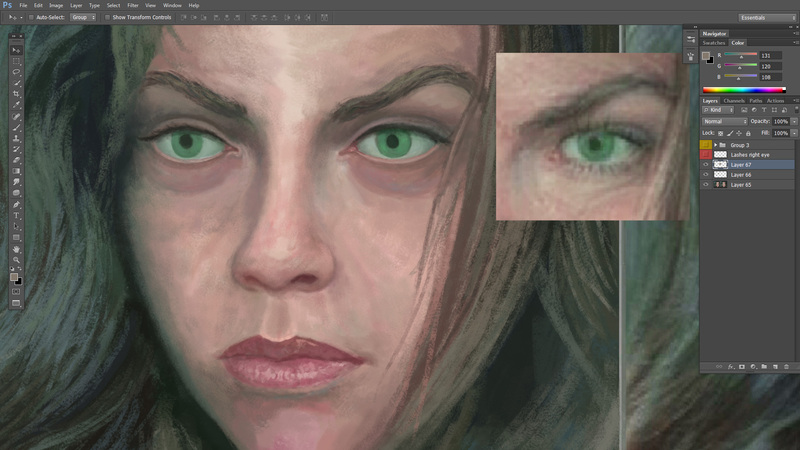 As with the eyes, I corrected the flaws by using standard methods (or my take on them) for realizing them. Below is the work in progress, and I circled one of the automated layer names, which is 107. That means that during the process of making this image I’d created over 100 layers. Sometimes I work on just one layer, but here I needed to try out so many different things that I was constantly creating new layers and then combining them. I have about 5 more I can do in this same style, at least. That’s one of the reasons I worked so hard on this one: to get the skills needed to do more. Here’s the whole series so far in a slide-show. Or you can see them in a thumbnail gallery. Just click anywhere inside to go into the screen-show mode. And if you like the (experimental) sort of art that I do, and you don’t want me to have to quit or put it on a back-burner, please consider chipping in so I can keep working until I drop. Through Patreon, you can give $1 (or more) per month to help keep me going (y’know, so I don’t have to put art back on the back-burner while I slog away at a full-time job). Ah, if only I could amass a few hundred dollars per month this way, I could focus entirely on my art and writing. See how it works here. Or go directly to my account. Or you can make a small, one time donation to help me keep on making art and blogging (and restore my faith in humanity simultaneously). 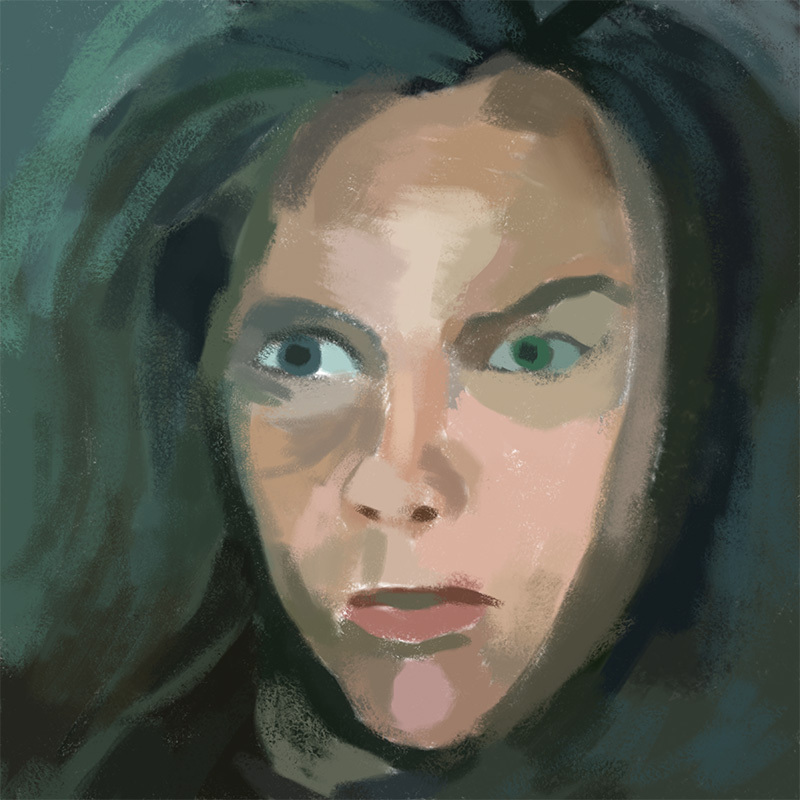 Posted in art, Selfies From Alternate UniversesTagged art, contemporary art, digital art, digital painting, girl, Green-Eyed Lady, painting, portrait, self portraitBookmark the permalink. I hope so. As you know, lots of my images are reproduced all over the internet with or more commonly without giving any credit. By me, the more people who see my art the better. Some of them will eventually connect it back to me and discover they already have seen one or more of my images. She looks fierce! Like a she-wolf character in a video game or a movie with superheroes. And those eyes are so hypnotizing. You certainly made it look effortlessly. It all works out smoothly in the end. Thanks. I’m glad I was able to pull off some of that vibe and make it convincing enough!